SON, NORWAY: In EYES WIDE SHUT, this was Therese Nortvedt ‘s third Solo Exhibition at Galleri Soon in the seaside town of Son, Norway. 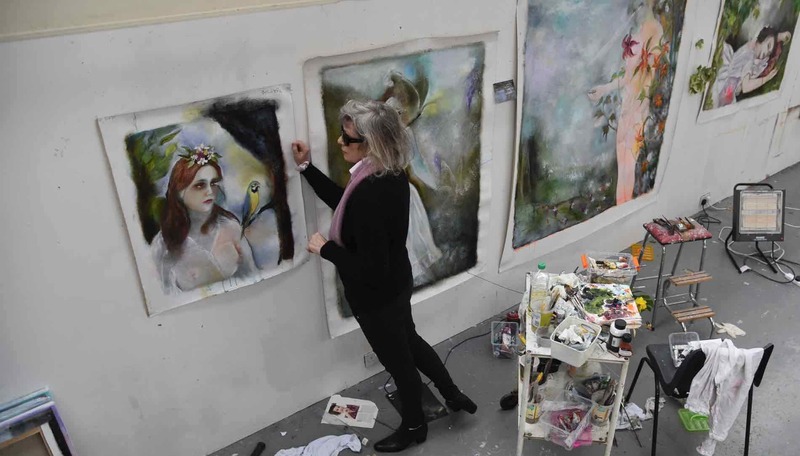 Here we were introduced to her new paintings and works on paper all made at her studio in Islington, North London. Dreamlike. In her canvases we are presented with female figures in a dreamlike state, all beautiful and seductive, inviting us in to a lush landscape, which envelopes the figure. In spite of their intense gaze, they are sidestepping our approach in an unattainable state of being. The turquoise cerulean bluish sky often perceived to be the male partner of a female earth is laden with butterflies and birds. Their wings emphasise their longing for flight and escape. Butterflies are associated with the soul, the invisible female spirit, linked with Thanatos (Death) and Hypnos (Sleep). Joy and summer. Furthermore, these Butterflies also symbolize summer, joy and longevity, a season of desire in the Nordic Hemisphere. We, the Voyeurs, are all invited in with, Eyes wide shut, to the magical and intriguing world of Therese Nortvedt’s new paintings. ”A central characteristic of Therese Nortvedt´s pictorial language is the mythical dimension of her motifs. She presents us with a personal mythology occupied by women, children, animals and dolls, often rendered in feminine pastel”. “She is illuminating the darker corners of our obsessions, fixations and insecurities with celebrity, yes; but less impersonally about ourselves. Hang on, I know you. And these paintings answer back: Are you sure? Nortvedt´s great achievement is to twist those statements 180 degrees and leave us floundering for the answer”.